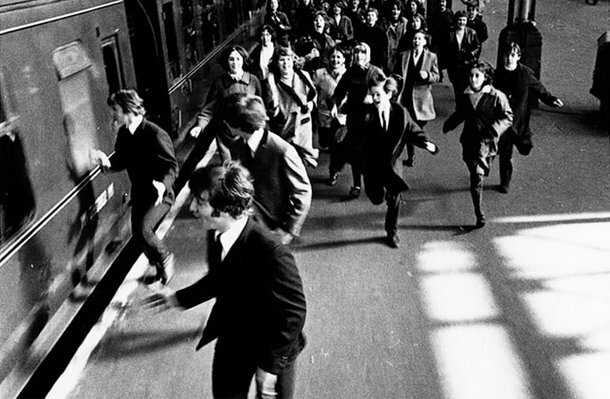 In A Hard Days Night (1964), director Richard Lester fashioned a screwball comedy around the Beatles as they were becoming a pop phenomena. His cameras followed them documentary style on tour. Where John, Paul, George and Ringo had distinct personalities, their fans, mostly young adolescent females, were a screaming mass. 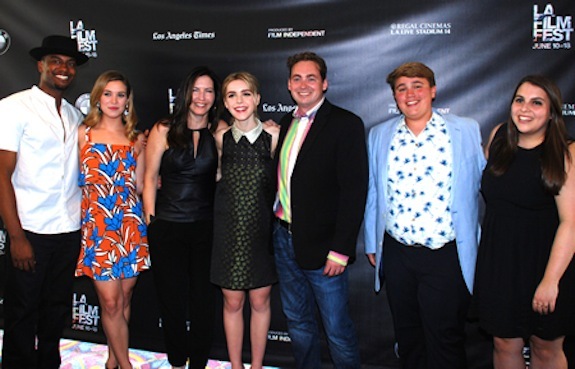 Directed by Paul Jarrett, Fan Girl (2015) puts super fan Telulah Farrow (Mad Men‘s Kiernan Shipka) center stage. An aspiring filmmaker, she’s challenged by her film class instructor to create something “awesome” for a contest judged by (drum roll) Tina Fey! After a failed first attempt, Telulah decides to make a movie about her favorite band, the pop punk sensation, All Time Low. It could be A Hard Day’s Night all over again (Appropriately, she’s adopted a silly British accent). The problem is the deadline and its coming fast. 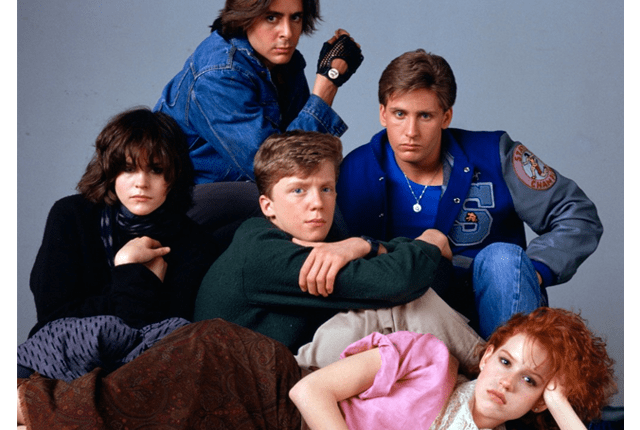 The film also owes a lot to teen classics like Amy Heckerling’s Fast Times At Ridgemont High (1982) and Clueless (1995) as well as John Hughs’s 1980’s brat pack oeuvre. However, It’s a brave new high school world out there. The convenient jock/nerd/stoner groupings are still around but have to compete with fashion bloggers and homecoming kings. Telulah has a diverse group of allies that includes her best friend, Jamie. She’s played by Kara Hayward, who was terrific in Moonrise Kingdom (2012) and the spooky The Sisterhood of Night (2014). A wise cracking Han Solo, skateboarder Hashtag (Danny Flaherty) hasn’t gone by his real name since middle school. He’s “just a friend” to Telulah while Charlie (Pico Alexander) could be something more, if they ever spoke. Asian Rosemarie (Annie Q.) forgot her Twitter password and is “so freaking out!” Joshua Boone is outstanding as Darvan, a charming “playa” with a heart. Finally, there’s Claire Bovary (Tess Frazer), an idealized vision who (like Princess Leia) may not even exist. During Fan Girl‘s premiere week at the 2015 Los Angeles Film Festival, I spoke at length with director Paul Jarrett and screenwriter Gina O’Brien who collaborated before on 2009’s Once More with Feeling. Crimson Kimono: Fan Girl is so up-to-date, technology wise, was it ever a problem keeping up with the devices onscreen? Gina O’Brien: It wasn’t an issue, but it was certainly a fear of mine that we would have this all shot and ready to go and there would be some new fabulous way of communicating. I was worried about that but so far I think we’re safe. 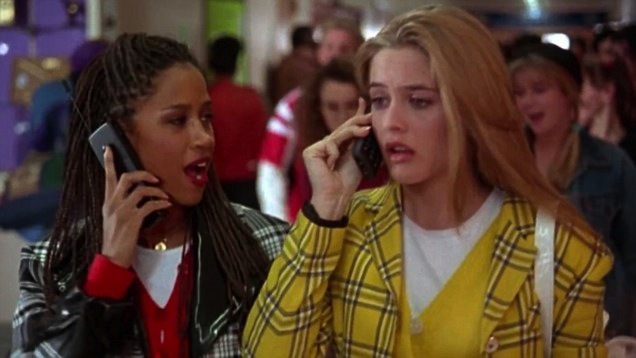 Stacey Dash and Alicia Silverstone in CLUELESS. Paul Jarrett: Gina did such a good job of researching this community–social media is such a big part of these people’s lives. 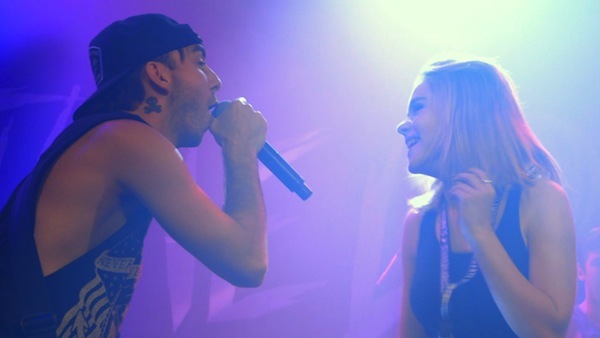 But social media is the backdrop where our story is really this girl and her passion for a pop punk group All Time Low . . . Our movie’s not about social media in itself . . . We didn’t use texts to tell part of the narrative but instead got inspired by All Time Low’s music videos. 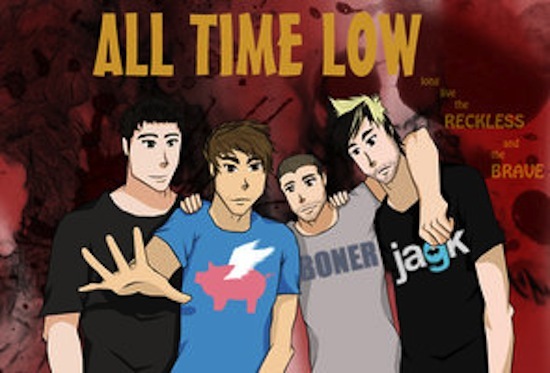 That’s why our film had these graphical parts, more as a nod to All Time Low fans . . . and our character has [the videos] in her head. CK: They’re not really my generation’s band but I’ve read they’re huge? GO: They just came out with a new album. PJ: Yes, their new album Future Hearts premiered number 2 on the Billboard charts behind the Furious 7 soundtrack and is Number One in the United Kingdom. I’d never heard of them until I got involved in the script and now I’ve learned how passionate their fans are. They treat them like the Beatles. GO: I think these bands have a relationship with fans that they never really had before because of social media. 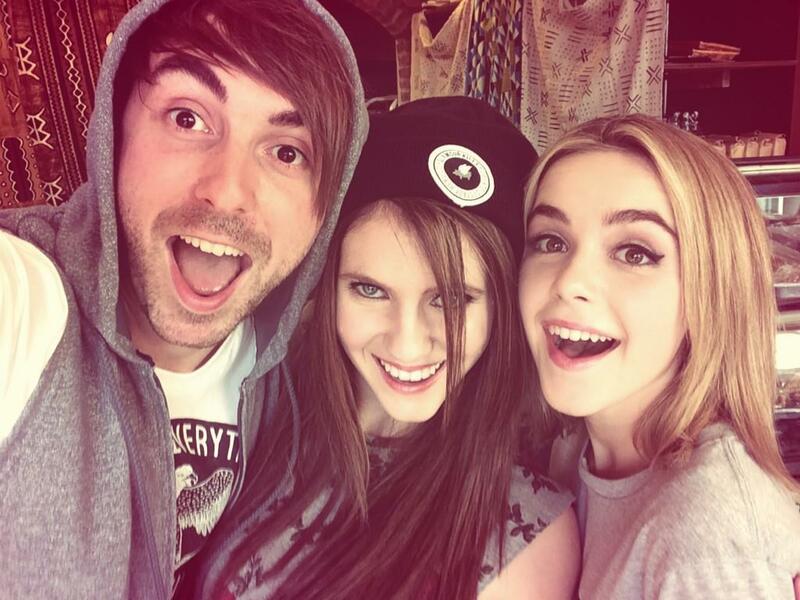 So when Alex [lead singer Alex Gaskarth] tweets something out, the fan base sees it and feels connected to him. CK: Were any of the kids in the cast fans already? Was it a big deal to them? GO: Yes. First, the story is very loosely based on my daughter and her friends. 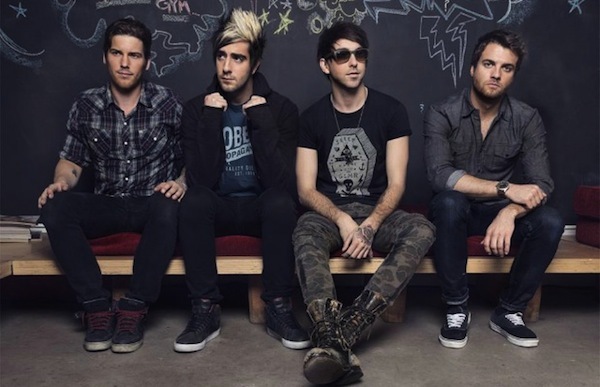 My daughter, especially, was a huge fan of All Time Low. She’s a little older now but at the time, that’s all I would hear in our house. CK: They’ve been around for ten years, from what I understand? GO: There was a scene that we shot in the Bowery Ballroom downtown and we needed some fans to fill the venue. One message went out and we were shooting at seven something in the morning and there was a line around the corner. PJ: That’s part of what makes the concert feel so real. Watching them engage with their fans after the shoot was so inspiring. That’s why they’re so successful, they’re really good at connecting. CK: Their songs are perfect for the movie. GO: (laughs) A lot of thought went into those songs. I listened to very specific songs for scenes for about a whole year. We were very fortunate to get many of them. CK: I was seeing it as more of a dramady, not a straight comedy. PJ: Fan Girl is a teen comedy. One thing that was helpful to me, working with Gina, was to not let the story of the adults overshadow the story with the kids and that it really remained Telulah’s story. And even though her relationship with Meg Ryan’s character is important, it never dominates or takes over. That was something we were really conscious of and tried to focus on. 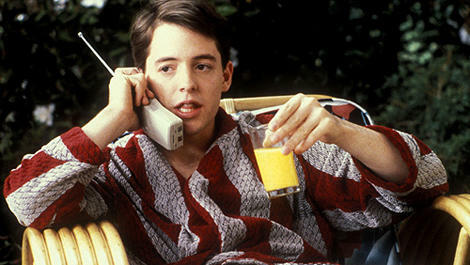 Matthew Broderick in FERRIS BUELLER’S DAY OFF. GO: To the kids, I don’t think the dramatic moments are very dramatic. It’s just a teenage daughter and mother relationship. That’s just the way it is very often. I think we tried to show a lot of irony and have the kids make fun of themselves. It’s really meant to be humorous and to have the kids see the humor in themselves. PJ: Luckily, we have great writing and the words are funny. And that’s one thing the cast really responded to: “The characters sound like us.” So, it got the cast excited and they brought “the funny” by enjoying the words and finding the right places to nail it. The thing about comedy, it’s like music, you just listen and you hear a rhythm and the rhythm makes it funny. There’s only a few moments when you’re with people’s emotions but then it changes and we’re into something funny or something musical. And that’s teenage. You always get to move on and change. GO: That’s exactly right. There have to be those quiet moments . . .
PJ: Yeah, yeah. And I think Telulah changes but as a teenager you never have this one huge epiphany moment when you figure it all out, a bunch of small changes to get you growing up a little bit. 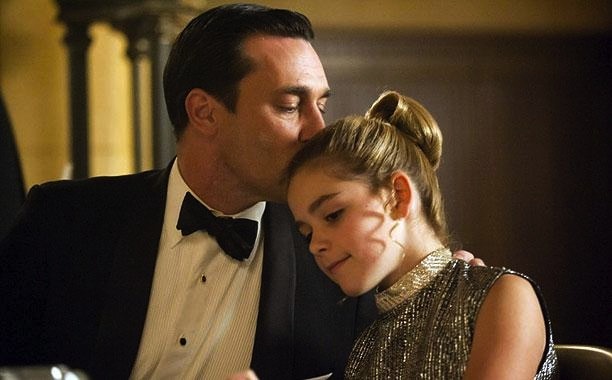 CK: Was Kiernan the first choice? GO: She’s such a brilliant kid. She came to the set everyday, there was a lot of dialogue to learn. She was spot on, she just was terrific. Very smart. And maybe because it’s their language and they knew how to speak it, she did such a great job. CJ: She’s so familiar as the Sally character. CK: But, it’s different in this movie. I might not even have known it was her. PJ: She’s an amazing actress. Whether it’s comedy or drama, she brings it everyday. CK: Since we’re talking about the cast, Meg Ryan, just getting her . . .
GO: That was a coup for us . . .
GO: Because she was my generation. GO: She’s my hero and I just . . . I have to pinch myself, still. GO: I’ve missed her, not seeing her [onscreen] in a while. The first scene we shot, when she’s outside the high school in the car. I was listening and I heard her voice and I thought, “Oh my gosh, we are so lucky!” . . . She just knows how to deliver a line, it really was an incredible job she did. CK: It really was. And about her character, I guess it’s a thing where kids teach their parents about technology. GO: Absolutely. I’m still learning. I’m very much in her character, but I’m also in every character in the film, from Darvan to Telulah. But as far as Mary (Ryan’s character) goes, I also have a group of friends, we all have kids who are teenagers and we all have questions about technology. So, she’s an amalgamation of all those personalities. CK: Speaking of Darvan, was he always African American? GO: Yes, he’s also based on a kid that sat behind my daughter in a class, larger than life personality. So, yes, he was absolutely going to be an African American character and I think it’s great because he ends up being larger than life, funny, and [SPOILER ALERT] a hero at the end so why wouldn’t I choose an African American kid. PJ: We all fell in love a little bit with Joshua. CJ: Is he sorta like that? PJ: He’s really great, this amazing singer and student of other people’s work. He’s constantly absorbing and learning and just brings it every day. That was a hard role to cast to get the pathos and the comedy and he nails it. Casting by PATRICIA DICERTO, C.S.A. CHRISTINE KROMER, C.S.A.